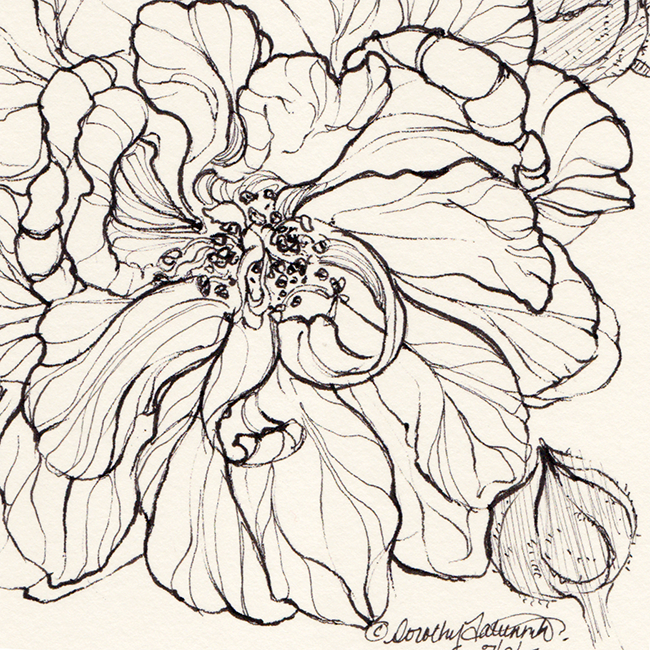 Happy Birthday Post – Ink Illustrations and Pencil Sketches From March! I once read a quote that said “growing old is a privilege denied to many.” I don’t want to ever shy away from my age but wear each year as a badge of gratitude. It’s a wild world out there and things get hard. I can say I’m still here, right now. Here’s to hope, life and believing in good. Nearly all of my family is international so I never really got to enjoy grandparents as a kid. We have a long-time family friend named Mary that has filled that space beautifully for me over the years. I saw this flower while on a walk with her. On a random note, I love the color of the paper in this sketchpad. That warm ivory is so lovely. I’ll miss it once the pad is done. These next sketches are from a meet-up with my co-workers just 2 weekends ago. We had an art night. It’s tough to get in “draw-for-fun” time when you’re a professional artist. This art night hopefully marks the beginning of the end of that challenge. It was delightful. 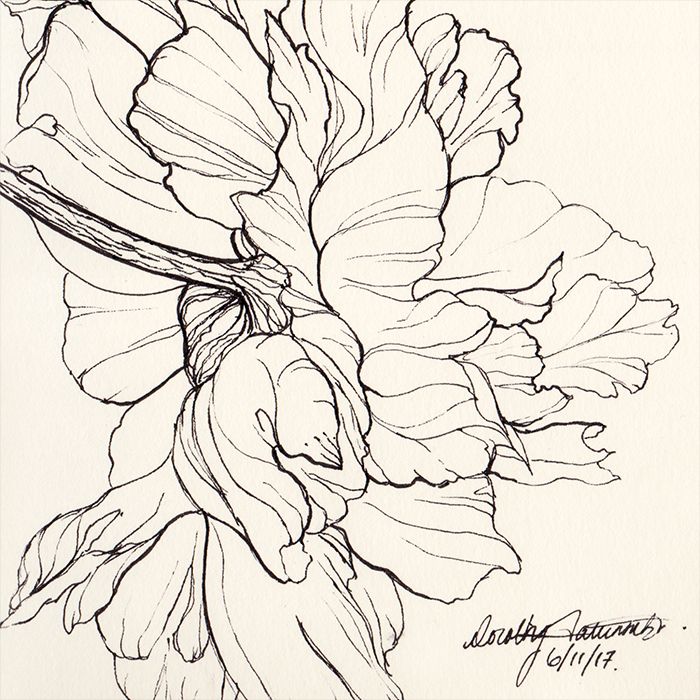 This last sketch needed more space so I used my larger pad that happens to have toned paper. Remember this from a previous post? It’s been a faithful sketch pad to me. Celebrating Black History Month with a collage I created to honor some of the great African American musicians of the 1900s. I used old photographs, old magazines, and paper textures to create this. It is inspired by the work of Romare Beardon. I must say, I just love making collages. Rearranging pieces, playing with scale, refining silhouettes, creating implied direction lines, and discovering interesting negative shapes is just fun! I am no Romare Beardon, but I hope to get more opportunities to create collages. I am sure it will refine my sense of composition. I normally use Photoshop to draw and paint and so I love having opportunities to use it for things that are outside of my regular range of tasks. Here, I restored a photo that is old and damaged. It is the memento of a dear friend. Here is the original photo, pre-restoration, with stains and marks. Below, I have used the healing brush, clone stamp, and the channel mixer to remove the damage. After restoring it, I added color and changed the background. I considered adding another figure that I had found in an old photo archive. But, I wanted to give my friend the final piece. Because of that, it was important to me to preserve the essence of the memory as is. She was delighted with the result : ). This was certainly a fun project. There is definitely room for improvement, but I am content with the result. Thanks for looking! Feel free to comment, like or share! 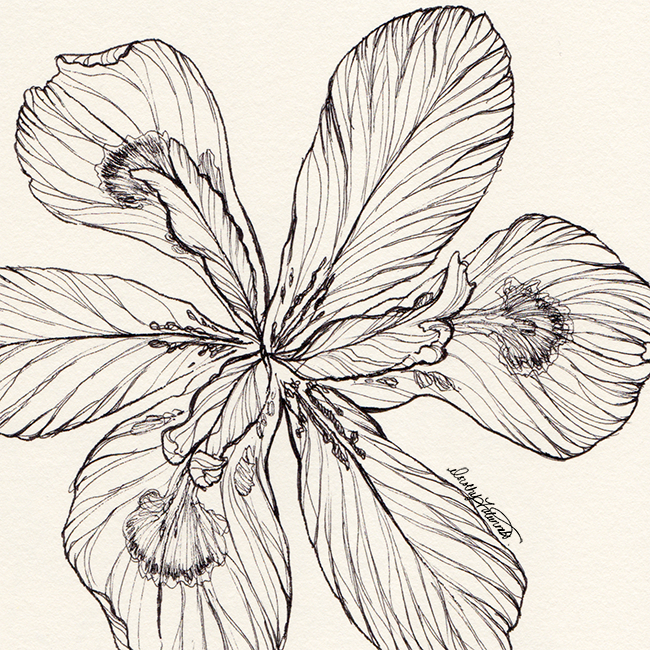 A Summer’s Worth of Blooms: Pen and ink flower illustrations. Hi there! So, it’s no secret that I love flowers. I think they have the loveliest sense of design and that they settle into the prettiest shapes. From robust blooms to delicate little sprouts; they just delight me! This spring, I attended an artist talk by Joan Linder. 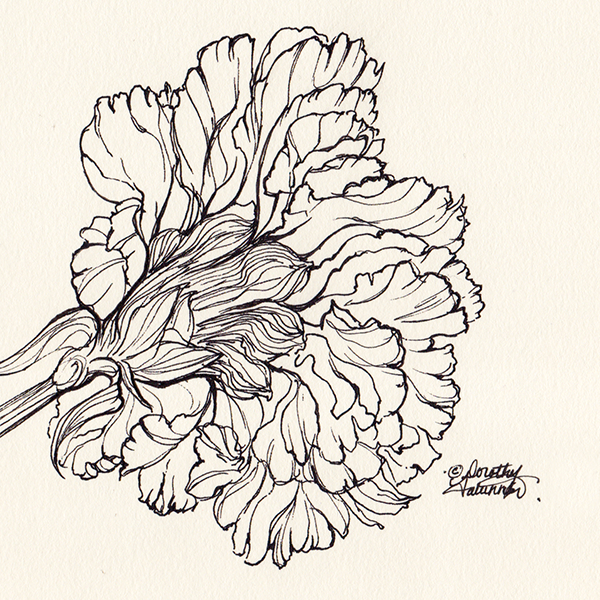 Seeing her intricate ink illustrations reminded me of how much I enjoyed working in ink. I love the boldness and the permanency of the lines and how every stroke is a statement that I can not take back. So, I thought, wouldn’t it be a nice challenge to draw in ink? I know of many artists that do this phenomenally and I have always admired that. 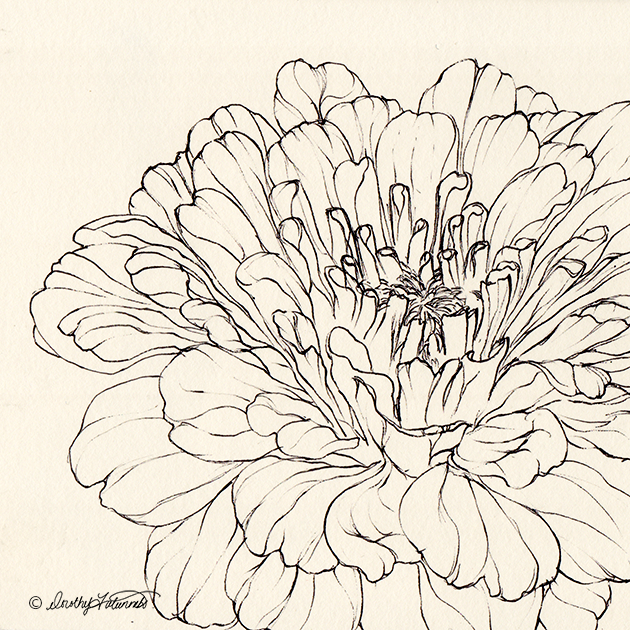 Below are flower ink illustrations that I have done this summer. 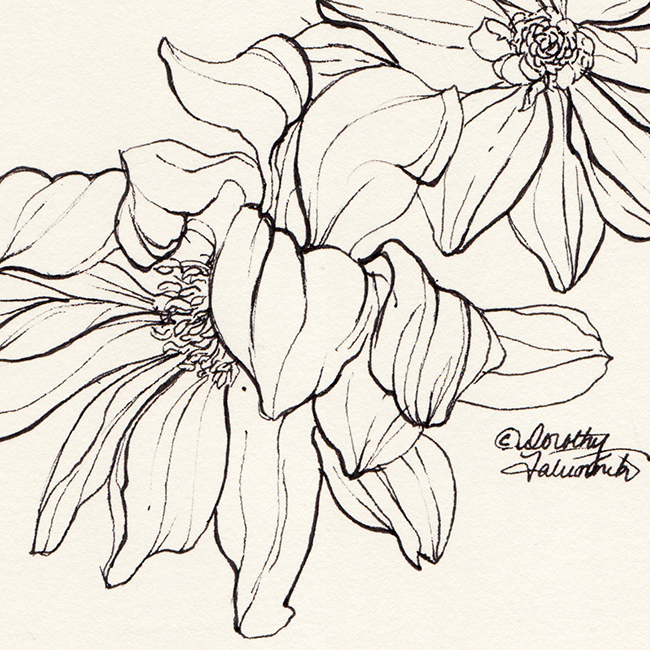 They are done in my sketch pad with a micron pen. They are drawn from garden walks and flowers in my neighborhood. Enjoy! Update 3/6/18: If you think it would be cool to hang this art on your wall or have it on your iPhone case visit my Society6 page for products with your favorite piece of art! Send me an message with recommendations of what to post if you don’t find one that you like already posted there. 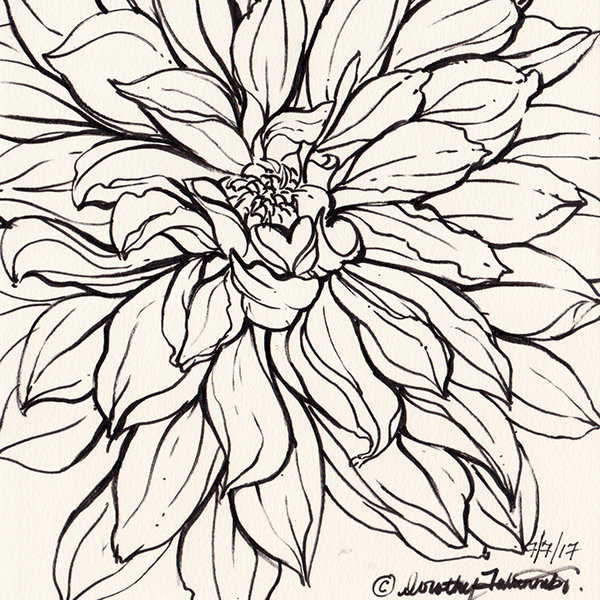 All of the floral ink illustrations that I have been posting on my Instagram have been inspiring me to revisit some line work that I have done in the past. 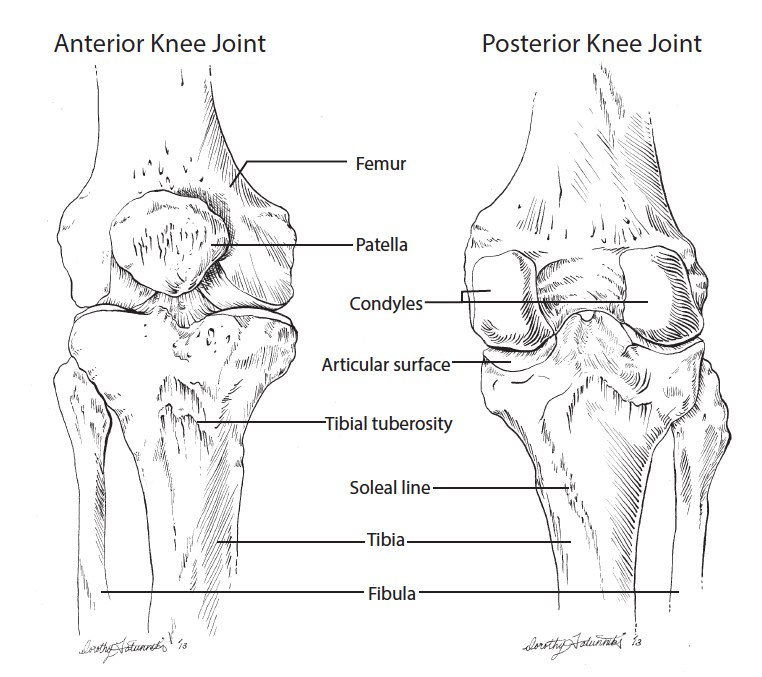 I revisited the medical illustration shown below. 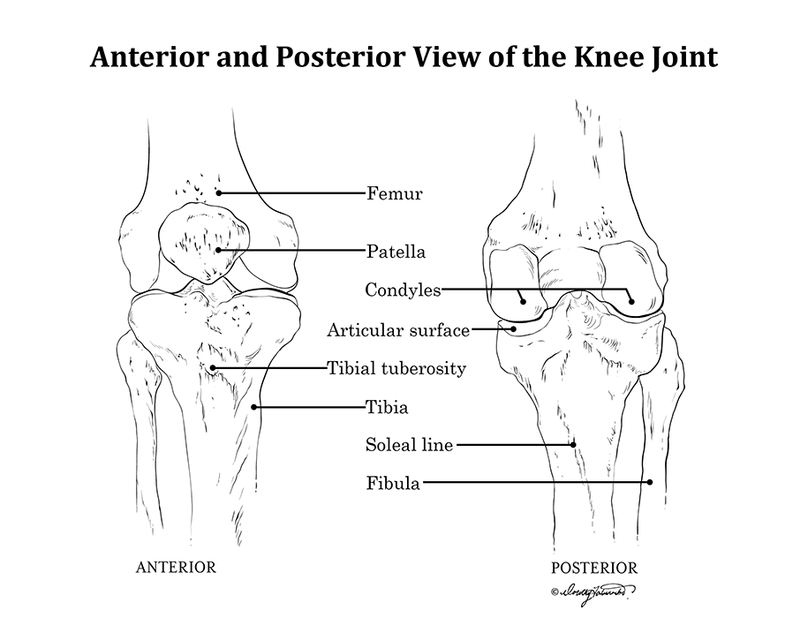 It depicts the anterior and posterior view of the knee joint. This is the initial pencil sketch. I tried to problem-solve the transition from pencil illustration to line art here. Looking back, I am happy with some of the solutions but not all of them. Here is the resultant line illustration that came from that sketch. Upon revisiting this, my goal was to simplify the line work. I wanted to get rid of the busy, angular and harsh areas. Below is the simplified version. This revision looks a lot cleaner and less cluttered. I tweaked the leader lines and spacing between the text as well. Here is a detail shot of the line work. I like the organic nature of the lines here. They are not as harsh and angular. Some of them were delightfully spontaneous! Next up, I am going to take some sketches of a hand that I did and convert them into line art using Adobe Photoshop. Thanks for looking! Check back next Tuesday for another post! Hello! I am following up on an earlier post that I made showing the color compositions of an illustration in progress. I had revisited my graduate school research project and created a new illustration. The goal here was to show how mechanically loading bone can stimulate changes in the actual bone structure. The final image is below! I entered this poster into the AMI 2017 Salon this year. Here is the “Intended of Purpose” statement that I submitted it with. As a side note, I find that runners are often depicted as fit 20-somethings. For my poster, I chose an older man because my research was also about osteoporosis prevention. Bone health is a lifelong endeavor and there are steps that we can take throughout all stages of life to strengthen our bones for the future. Lastly, I am updating this site little by little and will start publishing weekly on here. I hope you enjoyed the illustration. Have a great day! Dorothy Fatunmbi has an Instagram! Hello! 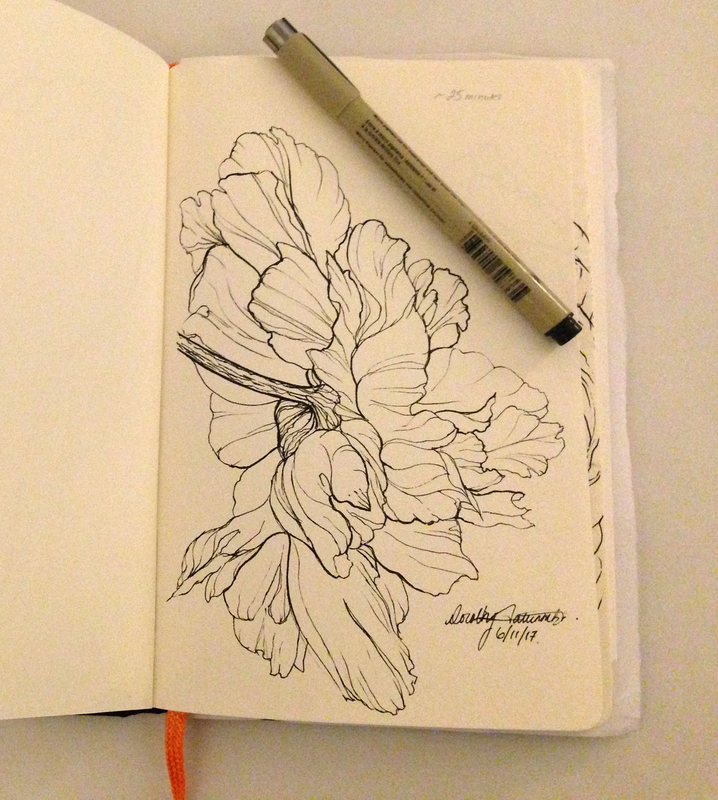 I got a small sketchbook earlier this year and started posting some sketches to Instagram. 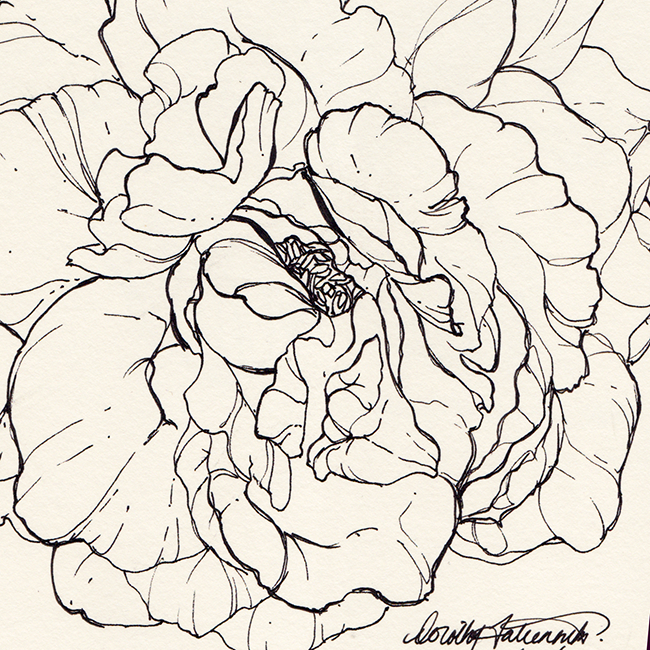 I wanted to build a habit of drawing daily. I figure the more work I can produce, the more problem solving I can do and the more I can close that gap between good and darn good! You can visit my page by clicking on the image below. My username is @dorothyfatunmbi. Take a look, follow and comment if you are so inclined! Have a good one! 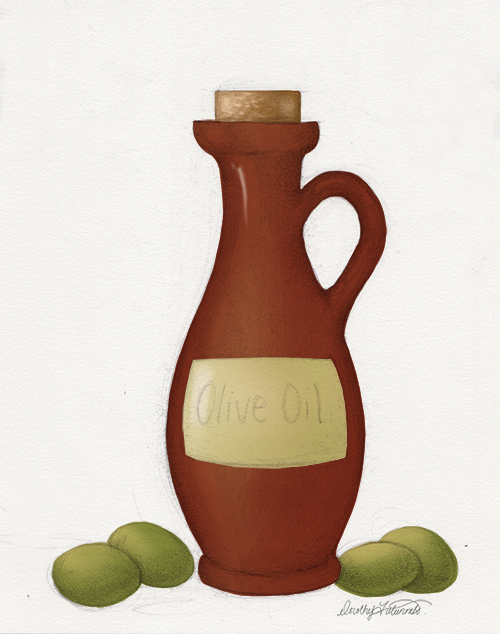 I am so accustomed to using Photoshop for digital painting, this was an interesting change of pace. I learned some new tricks and tips here that I now apply to my digital paintings! First, I placed the collected images in a general layout. I scaled and edited each photograph to fit the scene. Then I began manipulating the image with blend modes and scanned textures. Here, I continued working with blend modes, masks, and scale. 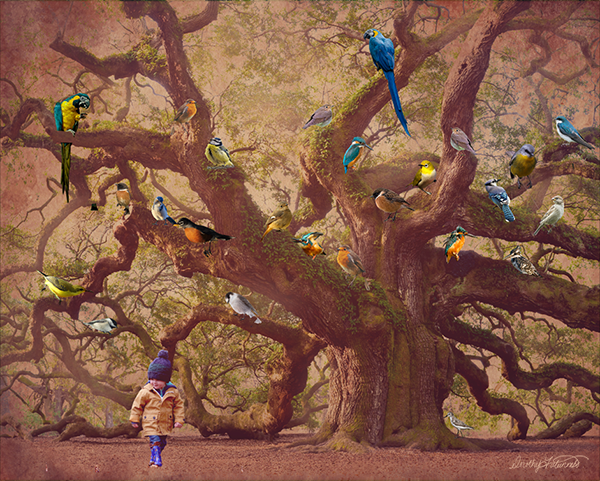 I changed the scale of the child and the birds and began integrating the birds more into the scene with painted shadows and masks. I also started orienting the birds so that some of them were facing the birder. I have a strong propensity towards warm hues as you can tell in the previous image haha. 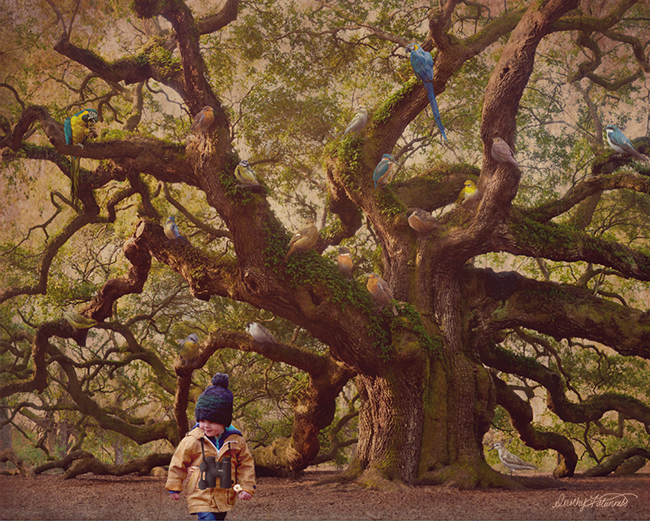 So I scaled back the warmth here, added binoculars and a scan of my Peterson’s bird book to tuck under the child’s arm. The final image is below! Every image here is open source except for the tree. Credit for the tree image goes to Louis Dallara. Thanks for looking! Hi there! I am working on a series of illustrations for a little project. 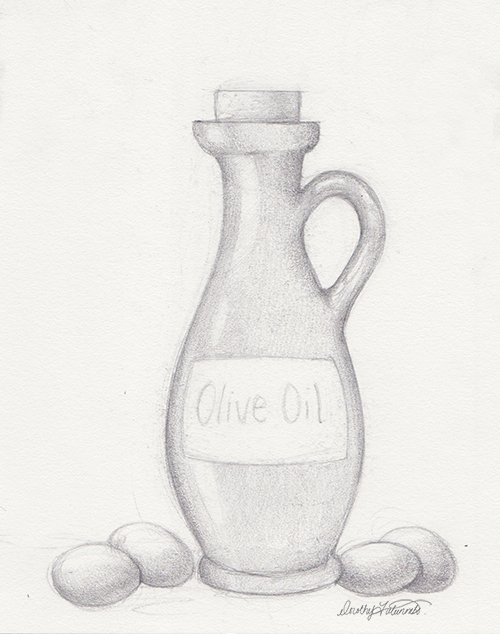 This one was particularly fun to do because I happen to love olive oil haha. If you’ve ever dipped fresh-baked bread in herbed olive oil, you know what It’s like – ambrosial. OK, moving along! Good reference photos made all the difference here. I photo-researched olives and dark brown glass bottles. Below are my Photoshop layers.